The Barnett Ghost Threshold Crossbow is designed to get you out in the wilderness or at the local archery club. It is an extremely high-quality bow with an 185-pound draw weight and a 20” cross from one axle to the next. It also comes with everything you need to start shooting including the quiver, arrows, rope cocking device, talon sling and a 32 x 32 scope. You can easily set up for your next shoot and you’ll be able to do it a whole lot easier with a crossbow than a more traditional version. Who is the Barnett Ghost 410 Crossbow Built For? Is this bow good for beginners? Can you hunt with this bow? Will you get a good grouping with this bow? Is a crossbow a good option for younger archers? The Barnett Ghost is built for those who want to improve their hunting capabilities or are looking for something interesting for their 3D experiences. For anyone who’s been hunting before this will be a great tool to help improve your skills and let you have a whole lot of fun at the same time. If you want to hunt or you just want to have a little fun with target practice you’re going to want this bow for yourself. If you order the Barnett Ghost you’re going to get all of the pieces and tools that you need in order to start shooting right off the bat. You’ll get the bow itself with a scope, quiver, and arrows as well as the sling that you need in order to carry it around with you. All you have to do is get online at Amazon or even Barnett themselves and you’ll be able to get this bow for yourself. You’ll get everything you need plus the warranty information and the owner’s manual to get you started and off on the right foot. This bow features CarbonLite Risers that are designed to make sure that you have the right balance as well as the right overall safety on your bow when you’re using it. These risers provide 5-to-1 safety factors and also help with the overall balance and speed of the unit. That way you’re able to shoot the bow easily and you’re also able to get a good quality shot out of it when you’re doing so, aiding in that great group or getting the animal that you’re hunting for. The scope is designed to give you a high-quality image when you’re trying to aim at your target. It’s large enough that you’ll be able to easily see the target (whether that be a live target or not) and gives you just enough zoom that you’re going to feel comfortable with where you’re aiming and what you’re shooting as well. Your scope is ideally positioned to make sure that it’s easy to see through and that you get the right image for lining up the shot and doesn’t add too much weight to the overall bow. The bow itself weighs around 7 pounds, which makes it very lightweight for this type and style of bow. It also provides a great deal of power for that lightweight style. This makes it a lot easier to carry around with you when you’re going hunting or when you’re going to be traveling a longer distance in order to get to your blind or where you want to practice at. The bow itself also features a sling that makes carrying even easier because it’s not only lightweight but it can be wrapped around your back for easier carrying. Finally, the overall balance of the bow is an excellent feature because it allows you to easily hold it by yourself without having to worry about the balance from side to side or the way it balances from the front to the back. You’ll be able to get a clean shot without concern for whether it’s leaning, even if you can’t actually see it. Though the bow will require you to have some level of control, it’s not going to be too off balance on its own and should be easier to hold in the right, balanced, position. This way you know what you’re aiming at every time. Yes, this bow can be used by those who are just starting out and are looking for a tool that will help them improve overall skills and understand what it takes to succeed. Yes, you can definitely hunt with this bow. You’re going to be better off hunting smaller game but you can still hunt large game as well. With the right amount of practice, you will definitely be able to get a great grouping. Many have been able to reduce their grouping to 1” or slightly larger by continuing to practice and work hard at their groups. This type of crossbow isn’t ideal for younger archers because it’s actually somewhat heavy and it’s hard to pull back. A crossbow, in general, takes a decent amount of time to pull back but with this bow, in particular, it’s going to take even more strength. The Barnett Ghost is going to improve your hunting abilities and it’s definitely going to make your free time a whole lot more fun. You’ll be able to learn a lot about archery and you’re definitely going to have a great time improving your own skills with this bow. 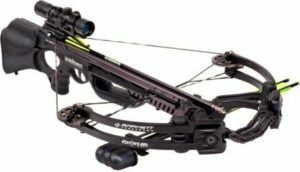 It provides you with everything you need for competition and for recreational use, so if you’re looking for something new you’re definitely going to love this crossbow.